I’m back with our next Pro-Follow update. 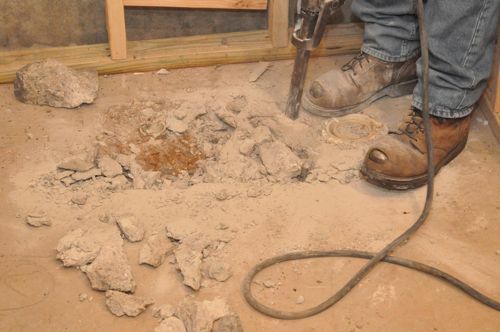 If you just joining us, I’m working with contractor Joe Bianco and his crews as they finish a basement including a full bathroom, wet bar, egress window and more. Check out the progress on day 1 here. 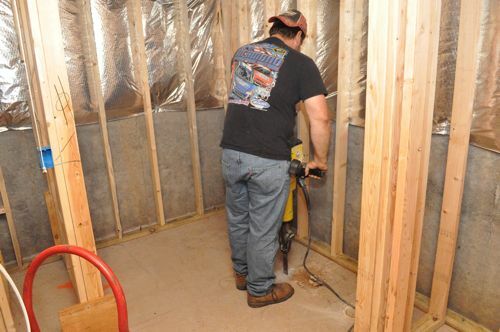 Joe brought in Charlie and Joey from Drain Relief Plumbing to complete the rough-in, and Charlie started by jack-hammering around the existing shower drain and toilet connection. 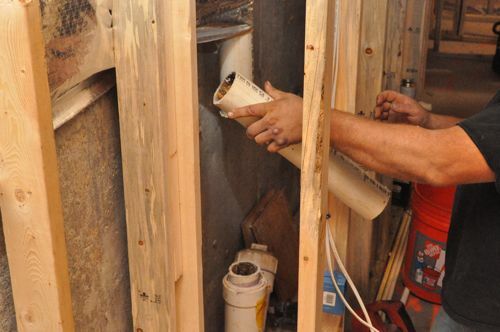 Pro-Tip: Click here for free access to the 2012 International Plumbing Code (IPC). The jack-hammering was slow going because this concrete has been reinforced with fibers for improved structural integrity. 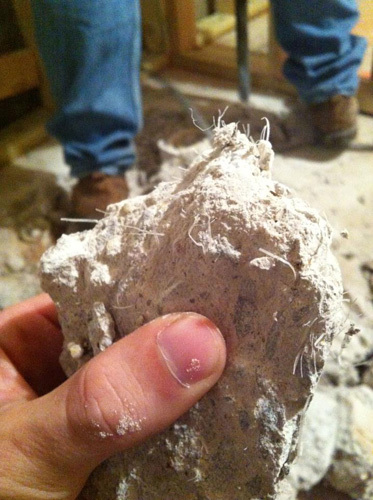 That piece of styrofoam acted as a spacer around the 3″ pipe for attaching a toilet flange. 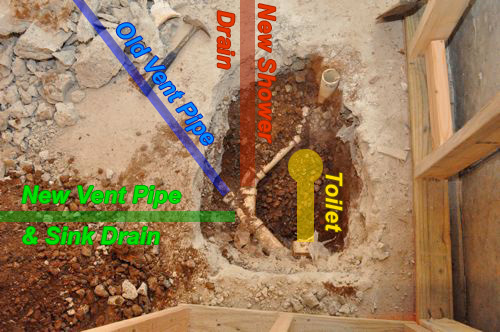 The existing plumbing was not laid out very well because the vent pipe was so far away from the toilet and shower. It would have required a long, convoluted connection or a really big bathroom with the vanity located on the opposite side. 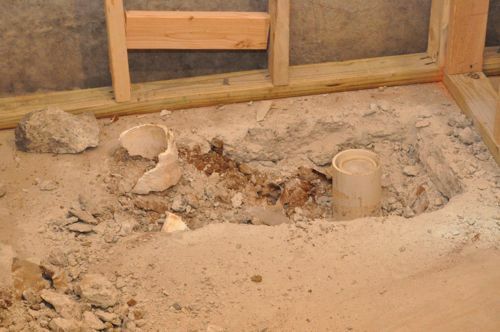 Instead, Charlie trenched through the concrete to run a new vent pipe and sink drain. 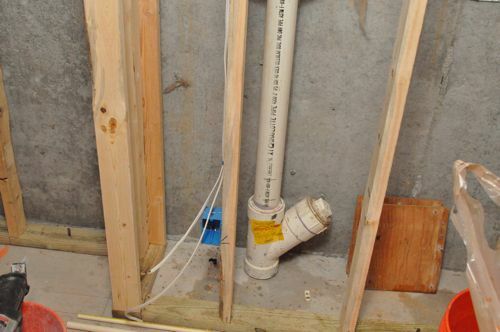 He capped off the old vent pipe and also relocated the shower drain. 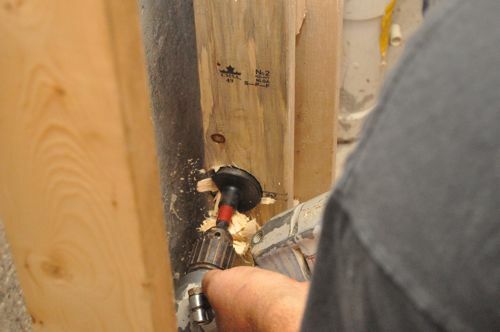 The plumbers also cut 2×4 blocking to fit in between the studs to secure their supply, drain and waste pipes. 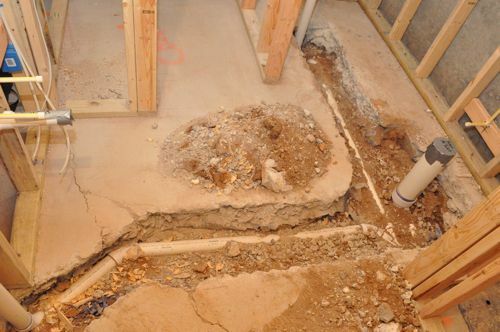 The plumbers ran new 2″ pipe and were careful to maintain the necessary 1/4″ per foot slope. This pipe will remain visible until inspection. 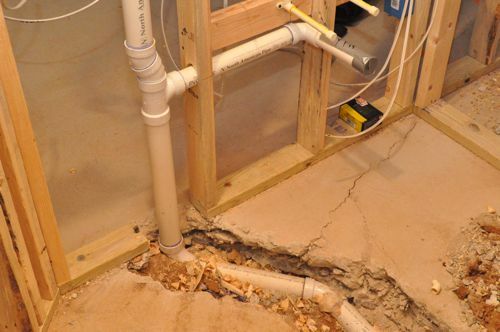 After that, the plumbers will replace the plastic sheeting and pour new concrete. 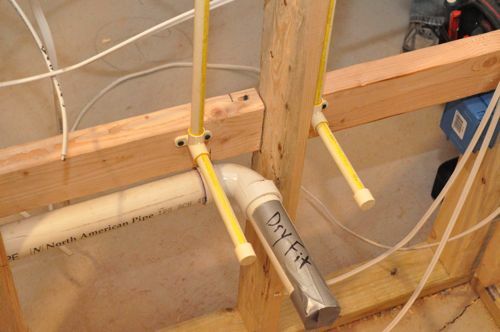 The guys from Drain Relief prefer to use CPVC for supply lines. The plumbers used 5″ shield plates at the top and bottom of the walls with smaller 1-1/2″ plates in the middle of the studs. 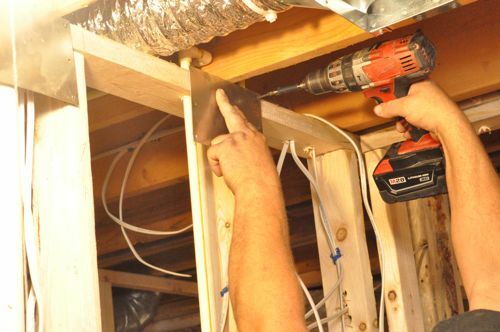 Pro-Tip: Section 305.6 states that in concealed locations where piping is installed through holes or notches less than 1-1/2″ from the nearest edge of the framing member, the pipe shall be protected by steel shield plates. 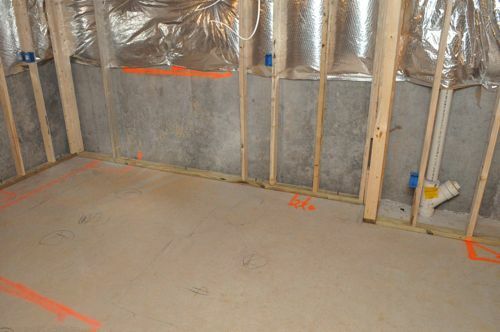 This basement remodel also includes a wet bar, and it will be located adjacent to the egress window. 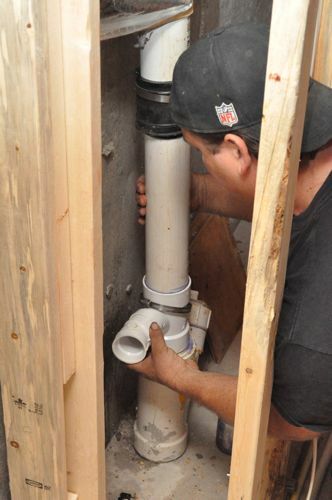 For the sink drain, Charlie cut the soil stack just above the clean out to add a 3 x 3 x 2″ sanitary tee. 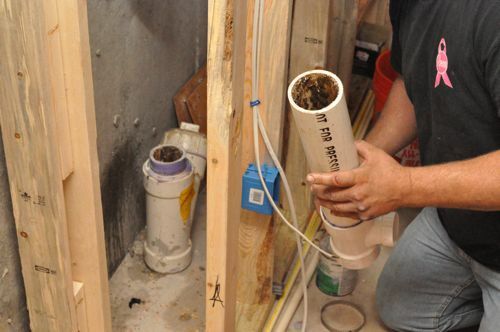 Pro-Talk: The clean out is a fitting with a removable plug that allows access to drains without requiring the removal of plumbing fixtures. 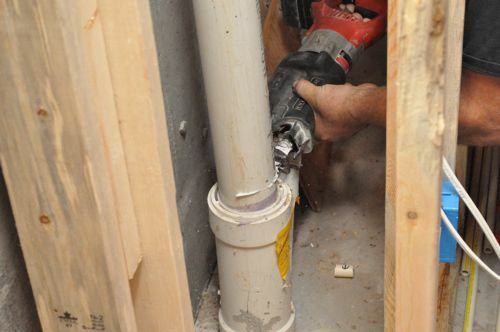 They are used for allowing an auger or plumber’s snake to clear a clogged drain. Pro-Talk: A sanitary tee is a tee with a curved center section. Charlie glued the tee to one side, and used a Fernco flexible couple on the other side. He would have preferred to use a PVC coupling. However, with limited “wiggle room” a Fernco is the best solution. 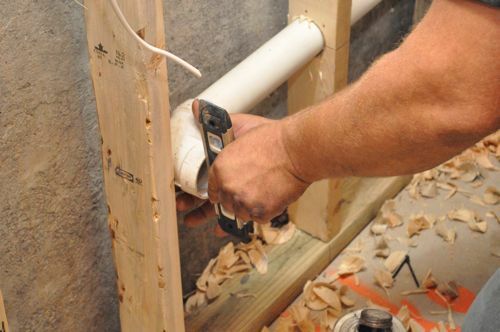 Charlie cut 2″ holes through the studs to run pipe. Later, he’ll add those protective shield plates. 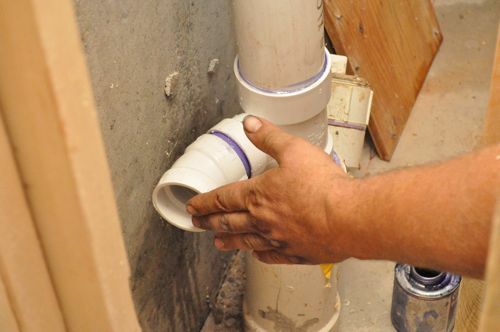 Pro-Tip: Table 906.1 of the International Plumbing Code (IPC) dictates the maximum distance of a fixture trap can be from a vent, and since this bar sink is only 6′ away, it doesn’t require additional venting. 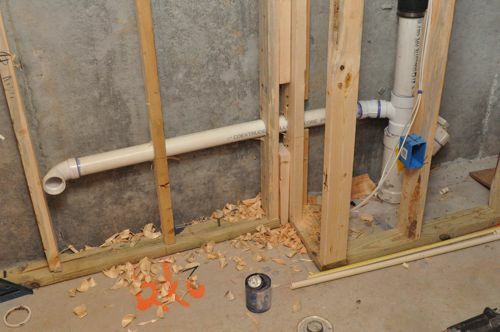 After the wet bar is framed out, the plumbers will be back to install another check-valve and run the rest of the drain and supply lines. 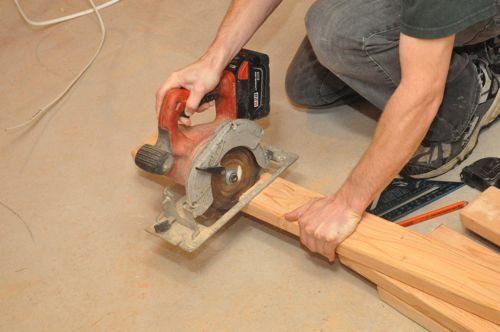 Joe’s crew will also be installing that egress window this weekend so look for a Pro-Follow update on that soon! OK, this might be a stupid question, but here goes. 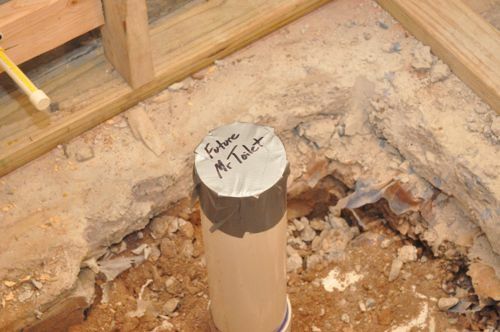 Is there a school for plumbers to learn all these intricacies? Or how else do they get their skills? 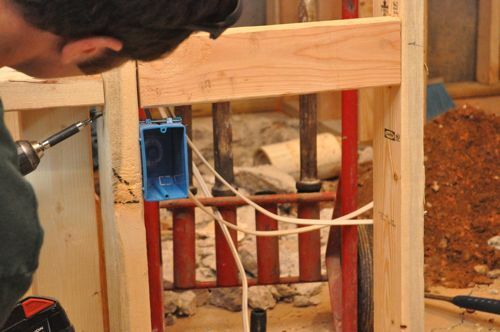 Do you know what kind of fibers they used when they were pouring the slab? Never heard of that before but it makes sense, and it’s interesting. It’s either polypropylene or polyethylene fibers. My mother was a general contractor before she retired. This is what she used to use: http://www.fibermesh.com/. It worked pretty well, if I recall. 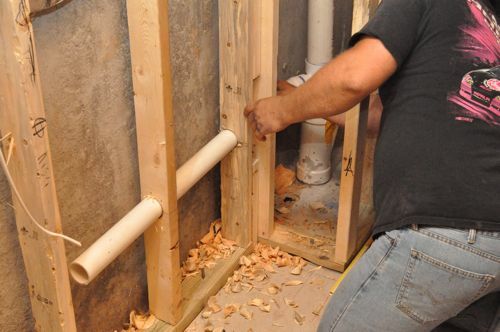 Why cpvc rather than PEX? Seems unnecessarily rigid. They really don’t wander as you use them. I wouldn;t worry about hitting the existing pipe. In my experience, they really don’t cut very fast either. You;d have plenty of time to adjust if anything started to go wrong. In fact, when we were tearing up a slab that was about 4 inches thick in the backyard (an old slab patio), it was much faster (but very tiring) to use a heavy 8 pound sledge. But I was about 16 and energy wasn’t in short supply.